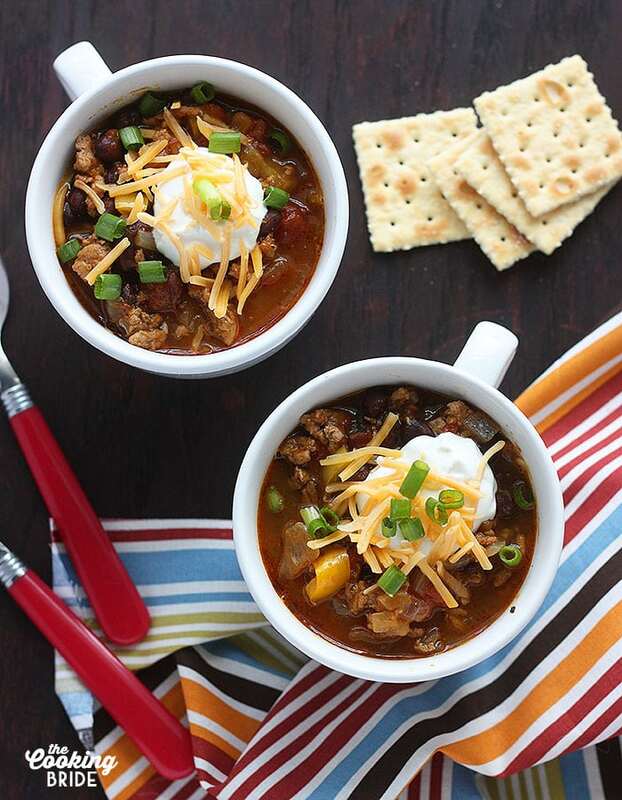 Easy turkey pumpkin chili is perfect for Fall! Black beans and Rotel tomatoes give it a Southwestern kick. 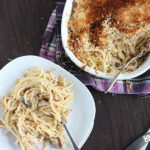 A rich and tasty cold weather meal. Just about every food magazine this month contains tips, tricks, and techniques for a fabulous Thanksgiving feast — how to get the juiciest turkey, the crispiest skin, the fluffiest mashed potatoes, and the sweetest cranberry sauce. This year it’s Thanksgiving with the in-laws, where my husband’s mother and his aunts have been making their time-honored holiday dishes for years. Since I am still a relative newcomer to the family, I have been asked to bring . . .wait for the drum roll . . . deviled eggs. Ho hum. I don’t even like deviled eggs. 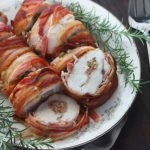 Instead of focusing on improving the holiday feast – I will save that for next year when I’m hosting my family and doing the cooking – I am going to focus on what to do when the guests have gone, your better half is snoozing in the easy chair, the kitchen fairy has left you with a sink full of dirty dishes, and you have enough turkey to feed a small third world country. I can’t really help you out with the dishes unless you are willing to arrange transportation for me on Friday and pay me a substantial sum to clean up your kitchen. Might I suggest buying a bigger dishwasher or forcing your children, if you have any, into indentured servitude? I can offer up a suggestion on what to do with the pile of meat sitting in your fridge destined for a month’s worth of turkey sandwiches. 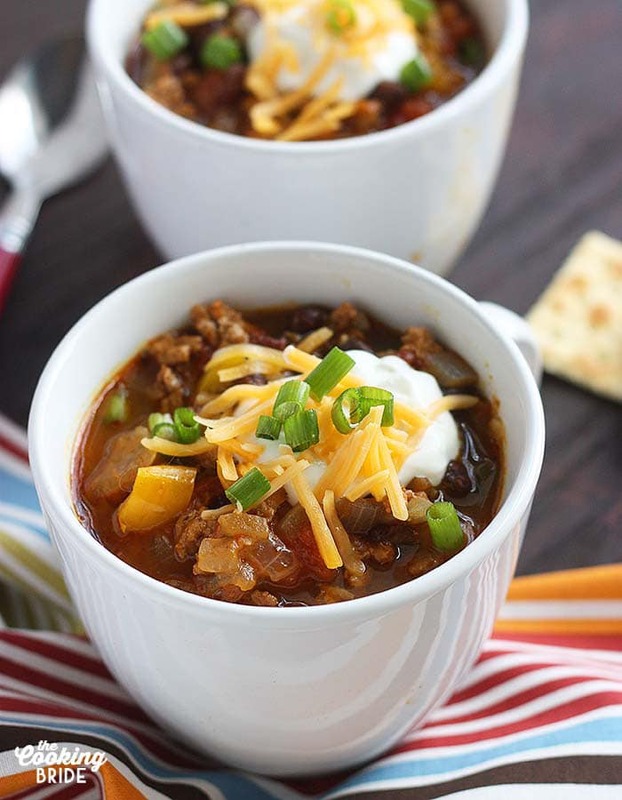 Make turkey pumpkin chili. 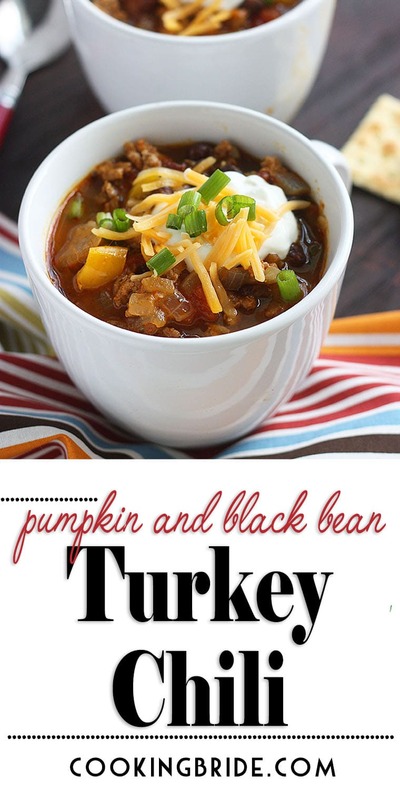 I was intrigued by the fact that this turkey chili recipe called for a can of pumpkin. Trust me, it does not taste “pumpkin-y” at all. 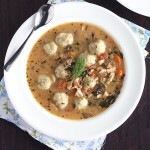 It actually has a nice Southwestern flair and the pumpkin helps to thicken the broth. Make sure you are using pumpkin and NOT pumpkin pie filling for this recipe. Pumpkin pie filling has added spices and sweeteners intended for a dessert, flavors that would not go well with a savory bowl of chili. Start by chopping or shredding about two cups of leftover turkey meat. If you don’t have leftover turkey, you can always use one pound of ground turkey meat. You’ll just need to cook the ground turkey meat first. Next, you are going to want to dice up a yellow onion and a medium yellow bell pepper. A medium bell pepper equates to about one cup chopped. Finally, peel and dice three cloves of garlic. Heat about two tablespoons of vegetable oil in a large stockpot over medium heat. Add the onion, bell pepper and garlic to the pan. Saute for about eight minutes, or until the vegetables start to get tender. Next, you want to add some chili powder, cumin and dried oregano. You can use fresh if you have it. Just keep in mind that dried herbs are more concentrated than fresh, so you’ll want to double the amount of fresh that’s called for in the recipe. Add three cups of beef broth, 2 cups of rinsed and drained black beans, one can of pumpkin. You can also add in your turkey meat to the pot at this point, along with a can of diced tomatoes. Sometimes I use Rotel tomatoes to add a little heat. But if you don’t like the spice or have littles eating this, use plain diced tomatoes. The recipe calls for 1/2 cup dry sherry. Cooking sherry is what I always use. In my grocery store, it’s usually found on the same aisle as the vinegars. If you don’t have sherry on hand, dry white wine, apple cider (not apple juice or apple cider vinegar), chicken broth or even water can be substituted. Stir everything together, then bring the chili to a boil. Cover and reduce the heat to low, then simmer for about 45 minutes to an hour, stirring occasionally. Season with salt and pepper to your taste. After I’ve ladled the chili into individual bowls, I like to sprinkle a little shredded cheddar, sour cream and green onions over the top. 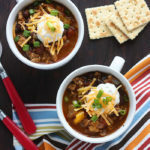 My husband swears this turkey pumpkin chili is better than his mother’s (please don’t tell her that). A few weeks ago my Dad stopped by for dinner and helped himself to three bowls. Please, don’t punish your taste buds by eating a month’s worth of boring turkey sandwiches. Just make this chili. This sounds marvelous! Chili season is just getting started for us. I love pumpkin year-round! This sounds like an interesting chili, although I would make it without the turkey. I usually make mine with zuccini and yellow squash, but some fresh pumpkin might be a good idea as well.